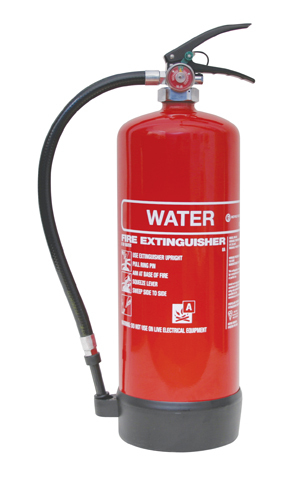 Water fire extinguishers are designed for use against Class A fires involving wood, paper, textiles and other class A risks. A water fire extinguisher works by covering the fire and cooling the fuel past the point that allows it to ignite. 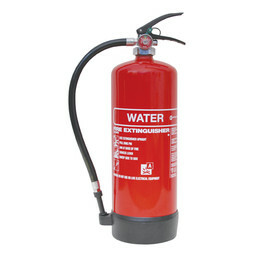 You can rest easy knowing your water extinguisher is supplier with a 5 year guarantee as standard. Both our 6 litre and 9 litre water extinguishers are manufactured in accordance with the current BS EN3 standards in a quality assured environment to ISO 9001 which is subject to continuous independent auditing. As proof of compliance every water extinguisher carries the BSI Kitemark and they are in conformance with the European Pressure Equipment Directive 97/23/EC. Delivery Hose : Black reinforced P.V.C.